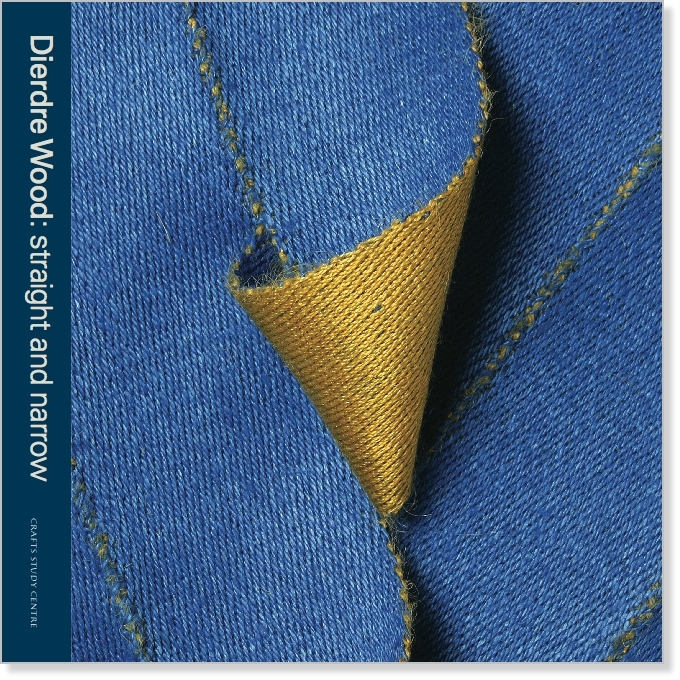 Deirdre Wood came to textiles quite circuitously, bringing to the discipline an integrated absorption of related crafts as well as the broader visual world of weaving. She talks persuasively about the various traditional textiles she has collected over the past few years – examples which do much to sustain her activity and inform her particular feeling for, and understanding of, the material. However, her background as a potter is another aspect of her interest in the structure of cloth and the three-dimensional possibilities of the medium. Perhaps it is because she came to the craft relatively late, having gained a more rounded experience of making, that she could see just what other directions were feasible, breaking away from some of the more traditional aspects of weaving. Quite simply, she has approached her craft from a very different angle. She met her husband, the potter and writer Nigel Wood, at Berkshire College of Art and, after marriage in 1969, both went to study ceramics at Farnham School of Art. Then, in partnership with two friends, they set up Meon Pottery in Hampshire in 1973, producing porcelain, stoneware and terracotta there until the mid 80s. It was, Deirdre recalls, an idyllic life, making a domestic range of pots which they sold from the premises and bringing up two daughters with no space and no cash, but in considerable happiness. When the children were small she began to teach herself knitting, soon producing enough jumpers to sell at a nearby market. For the next decade Meon Woollens was selling work round the country and by the time recession took hold and sales shrank, she was sufficiently involved to want to take her studies further. So, in 1992, she returned to Farnham to take a degree in woven textiles. Absolutely crucial to the work she has been making since has been her study of the Bamana mud cloths of Mali, in West Africa, and the strip weaving or narrow cloth technique, the processes of which formed the basis of her degree show. In 1996 she was able, through a bursary from the Royal Society of Arts, to travel to Mali to see this work first hand. While many other cultures have used strip weaving (the making of narrow sections of cloth which are then cut into shorter lengths and joined to make larger fabrics), Wood has been particularly attracted to the exuberant decoration of these Malian textiles, which also possess a strong symbolic function. The cotton bogolanfini (or, more simply, bogolan) still have a significant ceremonial role, important to their various rituals of life and death. Painted with mud and treated with vegetable extracts, they have long been aesthetically as well as culturally prized with their bold irregular geometric designs and beautiful colouring. With Caroline Hart from the Joliba Trust, Wood travelled extensively in Mali, collecting numerous mud cloths as she went and staying in isolated villages, including the remote Dogon settlement at Tireli on the edge of the Sahara, studying the indigo clothes produced there. Crucially, strip weaving of this type has given Wood considerable formal and constructive freedom. At Farnham she had already begun to develop one of her hallmarks, twisting the narrow sections before sewing the edges to make the longer structures. In this way she adds another element of construction already implicit in the weaving process and as the work has progressed, this approach has allowed her remarkable invention, enabling her to break away from the flat surface and the straight border. By using the strip method, she has been working with components, with building blocks, which can be organised into larger, more complex compositions. These techniques, moving away from the structures of the single weave and the two-dimensional face, have been a liberation, enabling Wood to explore any number of intricate grids, snakes, waves, ripples and lattices of form and vivid colour. She has created abstract rhythms across the surface that play not only on composite patterns and hues, but on shifting light as she investigates new types of essentially sculptural relief. The varied strengths of some of her dyeing adds further surface depth. In Deirdre Wood’s hands the sense of textile as object, not simply as plane, is implicit. Her use of the ‘backed-cloth’ technique, introducing the contrasting colour and pattern of a parallel joined warp to the face of the cloth, not only emphasises the counter-rhythms of her twisting method, but the quite new formats she employs, forms that, with their folds and pockets, eschew the familiar regularities of tapestry. It is tempting to compare Wood’s approach to parallel work in other mediums. It has something of the optical complexity of Bridget Riley but is so much more humane and subtle in texture. There are elements too of Frank Stella, François Morellet, Agnes Martin and other abstractionists. Yet the inner energy of Wood’s work (consolidated by the emphasis and patterning of her selvedges) is very much her own, and its forms suggest that the rhythms might well continue beyond the edges, the ‘frame’ of each tapestry. Such visual motion has affiliations with forms of modern minimal music too, but it would be more than reductive to consider Wood’s work on a purely conceptual level. It is just as much about the way she deviates and extemporises, bending and flexing the craft processes, and the deep cathartic stimulus she gets from the act of making, from the preparation of the warp to the variance in the dyeing (for example, in the Ikat resist technique). In talking about influences, she has said how important her former work as a potter and her subsequent study of basketry (“basket making – in some ways a craft that is halfway between ceramics and weaving”1) have been to her current, equally three-dimensional, activities. But, in studying these tapestries, it is clear how the resourceful and playful designs of Mali, as well as other fabrics from around the world, have remained integral. For all her sense of innovation, Wood, like contemporary textile artists such as Stella Benjamin and Michael Brennand-Wood, has kept a close eye on history as a means of moving forward, and also the inherent properties of the materials she uses. Of course Wood’s combinations of different fibres – wool, silk, cotton and linen – create richly varied surfaces, from the more abraded to the lustrous sheens. But their integration also enable her to coerce and manipulate the structures she makes. In the past two years she has “entered the world of curving strips”2 where “the warp threads begin as pure linen on the broad curve and graduate towards pure silk on the tighter curve”. It is, she went on to say, “the different shrinkage properties of the two yarns that make this curve possible”. She describes the weaving method as “a bit tricky, like trying to steer a bus with loose steering!”, but this is exactly the kind of technical challenge that Wood obviously relishes. This has taken her still further away from the conventions and commitments of ‘old’ tapestry. By making strips on a curving axis she can realise quite new structures on the wall. These strips, in single hangings or larger – multiple – groups, or making up giant discs, have a fresh architectural and abstract presence that really defines the space of a wall and room. The variation of forms seem limitless and as I write Wood plans to make tripartite fan-shaped pieces, curved Malevich-like crosses and more variations on the circle. She is determined to make one of these discs in a single weave. There is a new sense of movement in these curves, an energy that activates and delineates space, and they show again Wood’s ability to stimulate through particular relationships of shape and colour. Notice too the motional effect of distant blurring achieved by one of her dip-dye techniques. In Wood’s work you find little of the traditional, reassuring stasis of tapestry. Deirdre Wood communicates a real sense of passion, but it is a vocation she wants to share in other ways too. Conscious of the decline of the crafts in education, she has been keen to spread the word about textiles, and she and fellow weaver Ann Richards tour schools, colleges and village halls to discuss their skills and the art of cloth. They illustrate those talks with numerous examples and supervise practical sessions. This is yet another aspect of Wood’s optimism, her belief in a craft which seems to have endless ramifications. She feels she can take her work anywhere now. 1 Deirdre Wood, quoted in Tapestry – but not as we know it; Textiles by Deirdre Wood. Gosport Museum & Gallery, 2003, p8. 2 Deirdre Wood, letter to David Whiting, 30 March 2005.